seen here in the control room. Soaring high above Ilkeston Mines Rescue Station in Manners road is a 60ft wireless mast, focal point in two-way radio contact which will in future keep rescue workers called out to the pits in touch with the station. 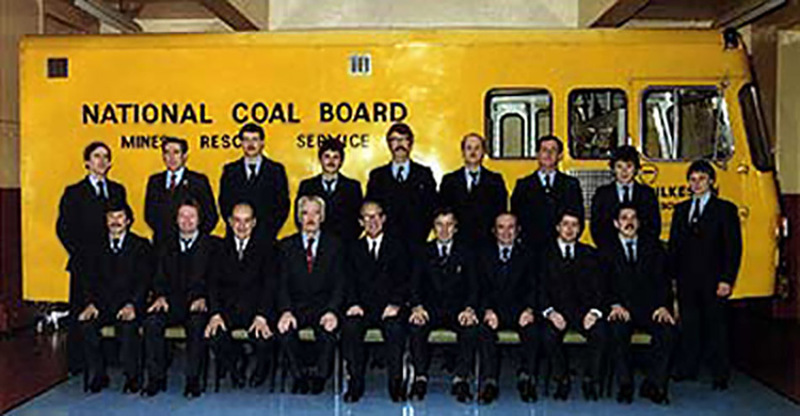 Ilkeston Station is in turn linked, by radio, with the other rescue stations in the East Midlands Division and the whole forms part of a nationwide linkup of mines rescue workers. Main purpose of the system is to relieve congestion on the ordinary telephone lines in major disasters and also to enable rescue workers to maintain contact with their parent station where no telephone is available. From a small control room adjoining the office of Mr. A.Syson, superintendent at Ilkeston. Mines Rescue Station, there may be heard: any Monday or Thursday morning, the twice-weekly tests made to check the efficiency of the system. Through a loudspeaker come the calls-"Mansfield Rescue Station Control calling Rotherham Station Control," then, "Mansfield calling Ashby," the replies, then "Mansfield Rescue Station Control calling Ilkeston Rescue Station control. Are you receiving me?" And Ilkeston's reply:- "Ilkeston 'calling Mansfield. We, are receiving you loud and clear." And so on, between Ilkeston and Ashby, and with the other-stations in the East Midlands Division linking up. In this, as in rescue operations, Ilkeston, Mansfield, Chesterfield and Ashby are linked. 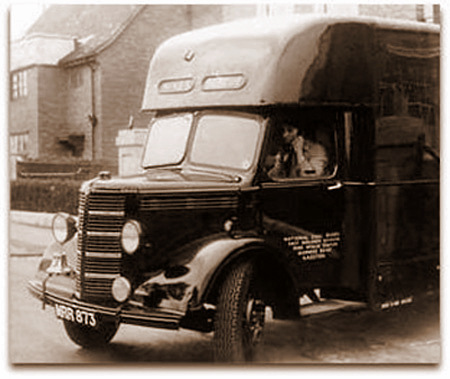 But if necessity arose, the radio link could be carried much further from Mansfield to Rotherham and the 'Yorkshire rescue stations, for example, or south into the Leicestershire coalfield. But that is only one portion of the system. Installed in each rescue vehicle leaving the stations now are portable radio sets by which they can keep in touch with the parent station. Even when the rescue vehicles go out on routine jobs at the pits, they are now calling Ilkeston Rescue Station, to make sure that radio contact is possible. On Monday morning for example, when an "Advertiser" reporter heard the inter-station tests being made, Ilkeston's rescue van was visiting Woodside, Coppice and Ormonde. From each came a call to the Ilkeston station. Les Havill - A.J.G Coulshead - A.Quinn. And as two-way tests are satisfactorily completed, on to Supt. Syson's map goes a red line indicating that that particular colliery has been checked for reception. Ilkeston Rescue Station covers a wide area, and on Tuesday Gedling and possibly Clifton, were scheduled for testing during one of the rescue van's routine visits. The radio linkup between the rescue stations came into full operation last week. Testing between the stations and the rescue vehicles at the various collieries is now going on and will be completed within the next few days. In case of emergency the van will take rescue workers to the pit concerned, as usual. 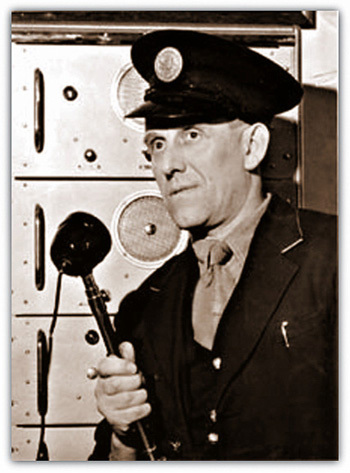 While they go underground a man, in the van, will be in radio contact with the mines rescue Station, receiving or sending messages direct instead of a probably overloaded telephone line. Operating the sets, with the frequency crystal controlled, is simple and all members of Ilkeston permanent staff are being trained for it. Thus, in this highly important sphere of communications, the mines rescue service is being equipped with the most modern methods, adding to the efficiency preparedness of this fine organisation. Eventually the big yellow van appeared on the scene. 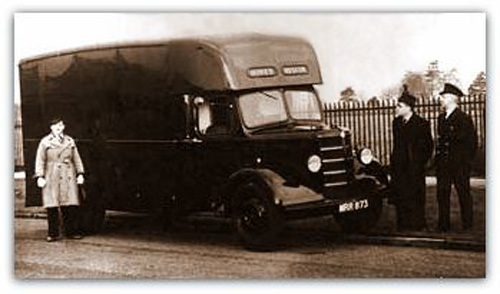 The first van where they could sit down to get changed. Thanks to Pete Searson for this photo. He can be seen on the front row, 4th from the right. Click on the van to see his picture.